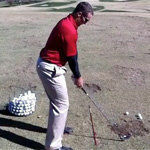 Aaron was an average high school golfer before he improved his mental game using Dr. Cohn’s sports psychology program. Dr. Cohn and Aaron worked for three months to improve his mental game and performance. Mike Fitzpatrick, Aaron’s dad, was really impressed by the remarkable turnaround in Aaron’s mental game and performance. You can listen in as Mike talks to Dr. Cohn about the significant changes in Aaron’s game after mental coaching. Camilla enrolled in Dr. Cohn’s MGCP program to help other golfers and athletes improve their mental toughness. After completing the self-paced MGCP program, she found that her own golf game improved. She had always struggled with letting go of mistakes. In the program, she learned how to cope with mistakes and play with more composure. At the time of the interview, she had just won the Gold Medal in the European Ladies Senior Championship. Sean has always been a good athlete. He was a DI college tennis player and was a high level cyclist. After sustaining some major injuries Sean took up golf. He quickly rose in the ranks and is currently an amateur golfer. Even though Sean was a skilled golfer, something was blocking his success. Sean could execute on the range, but had trouble taking this game to the course and knew his mental game was holding him back. 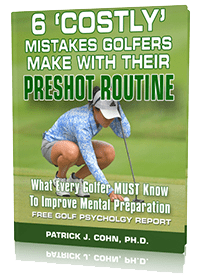 Listen to Sean talk about how he increased his confidence and learned how to take his practice game to the course after working with Dr. Cohn. Traci is an amateur golfer who plays up to 60 rounds a year and has read Dr. Cohn’s golf books and Confident Athlete CDs. She was a perfectionist who wanted to play a perfect round and thus struggled with her confidence. She changed her mental game by focusing on smaller goals and dealing with her negative self-talk.